The perfect skirt for the girl who wants to look cute and also play hard. My daughter is non-stop, but also likes to wear the girly things in her dresser. 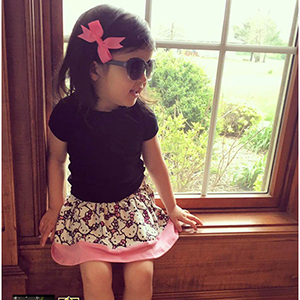 I created this skirt so that she can choose what she wants to wear and still be ready to play hard with her brothers. 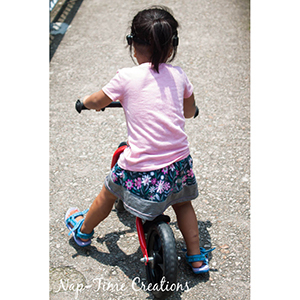 The summer play skirt has a flat front waistband and elastic back. 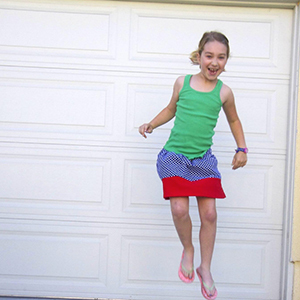 A gathered skirt has built in shorts so you never have to worry about what you are playing while wearing this skirt. 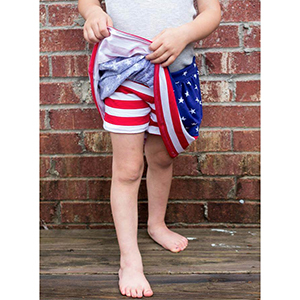 This pattern is available in sizes 18m to 8. Suggested fabrics are cotton lycra, cotton jersey, french terry, or brushed poly spandex. Two fabrics - 1/2 yards of each OR 1 yard of fabric.